Your ongoing support and solidarity have helped our community speak nonviolent truth to power. 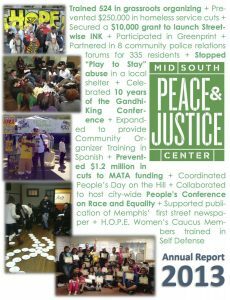 Thank you for your support of the Mid-South Peace and Justice Center. Training 524 leaders in grassroots organizing. Preventing $250,000 in homeless service cuts. Partnering in 8 community police relations forums for 335 residents. Stopping “Play to Stay” abuse in a local shelter. Celebrating 10 years of movement building at the Gandhi-King Conference. Expanding to provide Community Organizer Training in Spanish. Preventing $1.2 million in cuts to MATA funding. Coordinating People’s Day on the Hill bringing together grassroots leaders from across the state. Collaborating to host city-wide People’s Conference on Race and Equality in response to KKK rally. Take a moment to look through the 2013 Annual Report and celebrate our victories. They would not have happened without you. Join our Sustainers Circle, our convenient monthly giving program. Your generous gift makes our important work in the community possible. Please take a moment and join securely online now! When we stand together change happens. Thank you for standing with our community. Thank you for continuing your support of the work of the Mid-South Peace and Justice Center. And thank you for all that you do.